Archiving your music can be simple. A good many people worry that they will have to buy all their favorite albums again in order to get into Streaming. This isn’t true; you already own the music and all you need to do is to archive it safely onto a storage device. But ask yourself if you really want to do this. A subscription to Tidal will give you access to an immense library of music there when you want it. But if you do wish to archive your music; read on. We’ve already discussed the Bluesound Vault solution. This takes care of everything for you and has everything needed under the lid of one device. Another way to achieve this is to use your computer and dBpoweramp. 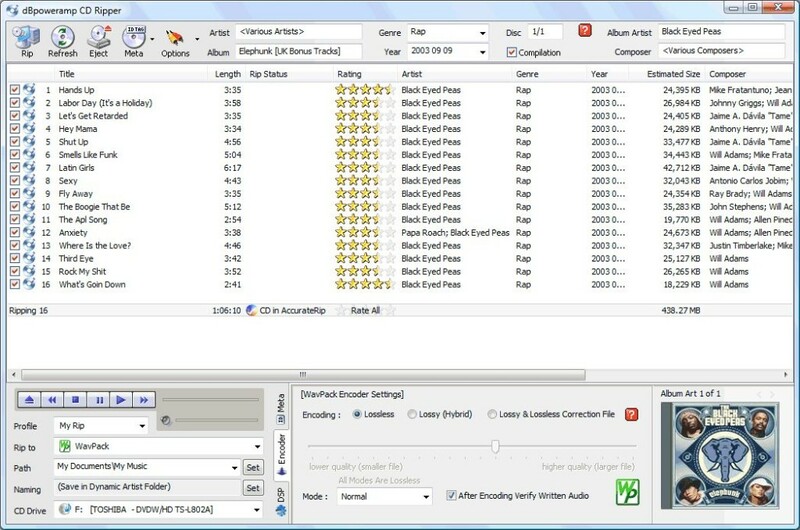 This is a piece of software that makes bit perfect copies of your CD’s with very little effort from yourself. Basically you insert a disc and let the software discover what the disc is, find all the track data, genre information etc before archiving an exact copy to your music library. The software makes repeated passes at the CD until it has captured all the music and then tells you that it has taken a bit perfect “rip”. It access music databases in order to gather album artwork and also to ensure that your “rip” is perfect. There are other rippers but we prefer this one; we find it easiest to use. It also has some handy other features that enable you to do clever things with your music library. These include converting copies of albums to other formats for i-Tunes or for portable players. This screenshot shows dbpoweramp ripping a Black Eyes Peas CD. Once your CD’s are archived you can box them up and put them somewhere safe. Interestingly a bit perfect archived copy of your CD can sound better than the CD itself! That sounds like witchcraft but when you bear in mind that CD players are rarely able to recover all the data on the CD but a Streamer does so every time it starts to make a little more sense. Every time you play the album you get to hear 100% of it. Click here to discover how to store your music collection.